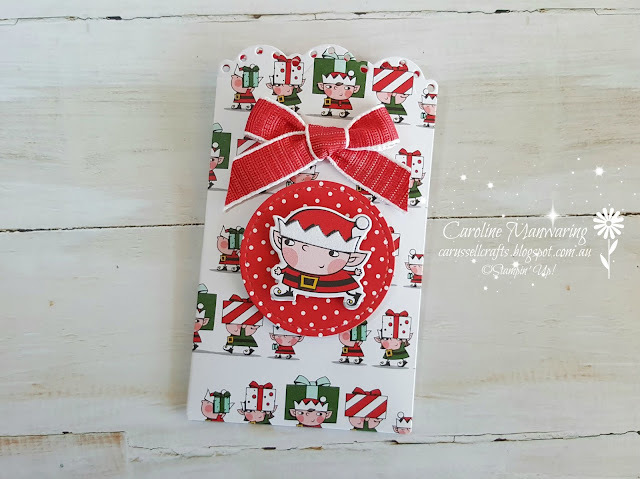 I CASE'd my project tonight from one by Julie DiMatteo of The Paper Pixie. You can view her project here. As soon as I saw this little pocket envelope I knew I just had to make one. I'm using products from the Santa's Workshop Suite. The suite is in the Holiday Catalogue that customers can purchase from September 5th, that's just 7 days to go, the countdown is on! 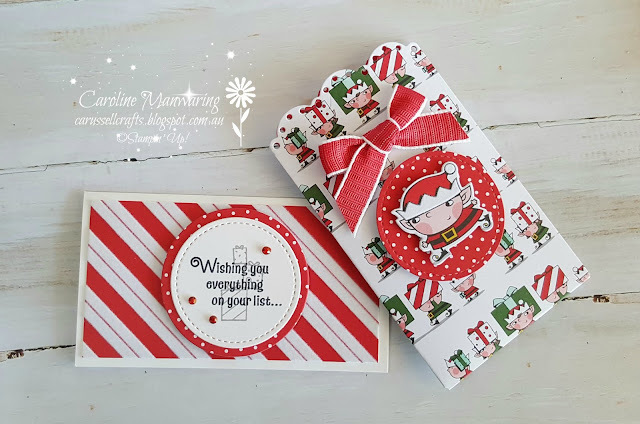 The Signs of Santa bundle of stamps and coordinating framelits is cuteness overload! 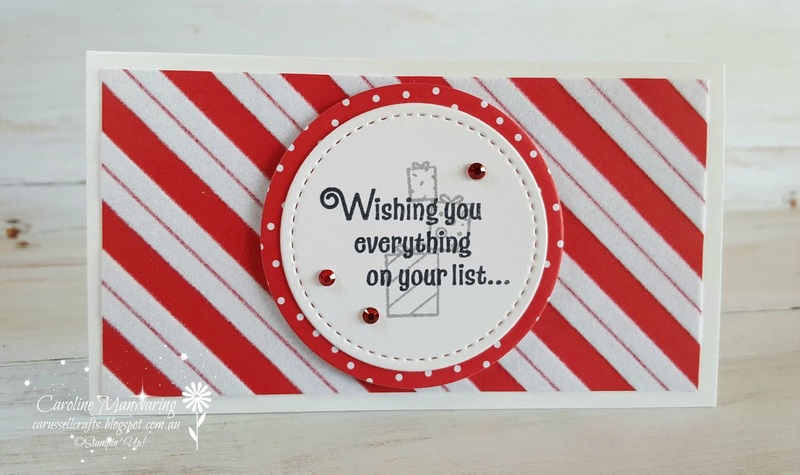 The DSP was the perfect choice for this little project and I just love it. The pocket is made using a 6" x 6" piece of DSP on the Gift Bag Punch Board. 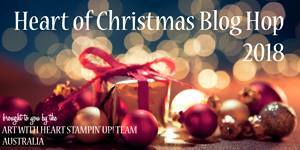 Julie shares all the measurements on her blog, she has also made a short video on the project. One of the fun things about the DSP is that the framelit dies cut out images directly from the paper, and that's what the little elf on my envelope is, it's one from the DSP. How clever and fun is that?! The stitched circle behind the elf is another of the patterns in the pack. The top edge of the envelope was die-cut with the scalloped edge border from the Spot of Tea framelits. To finish the decoration I added a bow made from the Poppy Parade ribbon that's part of the suite. If you're looking at the white stripes on the card and thinking they're blurring a little bit, it's actually flocking on the DSP, and you can't help but touch it or run your fingers over it. 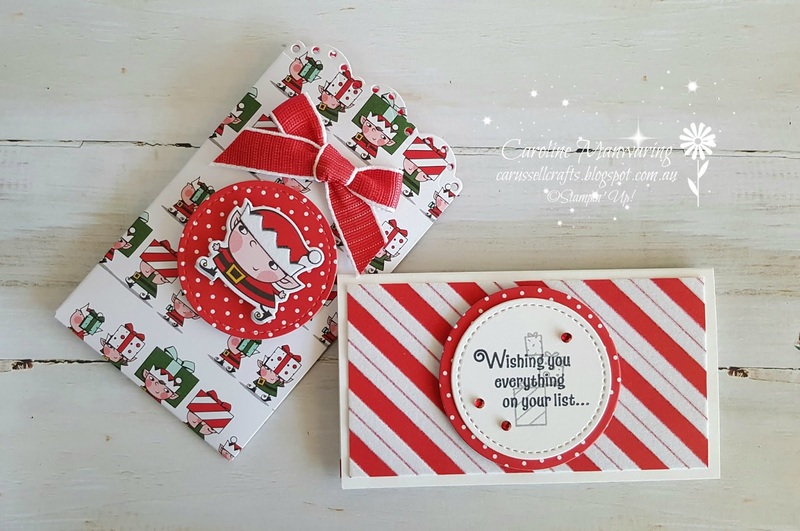 The card is one of our narrow note cards and it fits perfectly inside the envelope and will hold a gift card. Inside the card I added a strip of the scalloped border print from one of the patterns in the DSP and it mimic's the top edge of the pocket envelope. 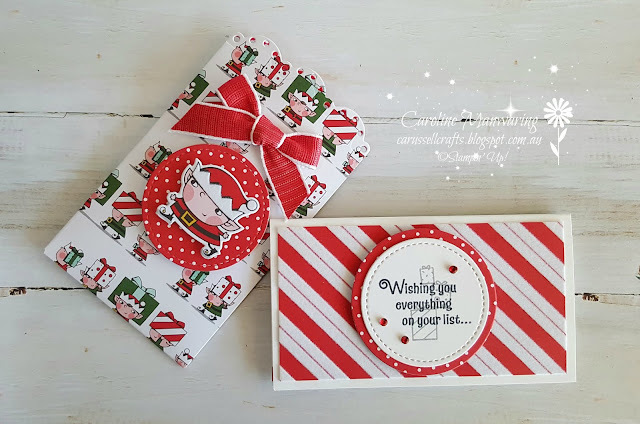 Thank you for stopping by tonight, I really hope that you're enjoying our Heart of Christmas projects each week. To see what everyone else has created tonight just use Claire's link below.